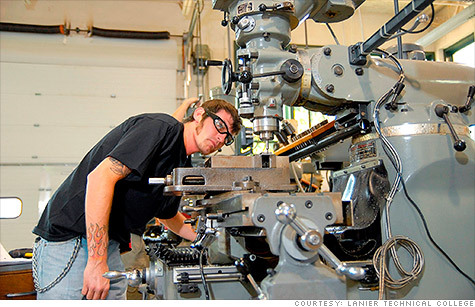 NEW YORK (CNNMoney) -- Trade schools nationwide are bursting at the seams as demand for skilled factory workers pushes enrollment to record highs. Trade school officials say manufacturing programs are experiencing an influx of students -- young people starting out, mid-career workers who are retraining after a layoff, and incumbent factory workers. "That's the highest level of enrollees we've had in 15 years," said E.J. Daigle, the school's director of robotics and manufacturing. For the first time in the school's 99-year history, Dunwoody will this fall introduce a six-month certificate program designed to fast-track training. "Most of these fast-track students are older, in their 30s and 40s, who can't take two years off to go to school," he said, adding that these students have the option to return at any time and complete the two-year degree. Demand for skilled workers has shot through the roof in his area, spurred largely by Minneapolis' robust medical devices industry led by Medtronic (MDT, Fortune 500), said Daigle. "We graduated 20 students in June and we had 400 inquiries about them from manufacturers," he said. It's a similar story in parts of Wyoming, said Ami Erickson, dean of agriculture and technical careers at Northern Wyoming community college in Sheridan and Gillette. Starting salaries run as high as $80,000, and possibly more with overtime because of the worker shortage. Not surprisingly, the school's diesel and welding technology programs have large waiting lists, she said. Erickson is on the hunt to add instructors in both schools but money is tight. "As a public school, we're funded by the state. Lately, we've had a pullback in funding," she said. Related: Nine months in trade school. Job guaranteed. "We expect enrollment in our programs will jump 8% to 15%, said Barrow. But accommodating more students is a challenge. "Our most hands-on classes have at most 20 students each, for adequate training and safety reasons," she said. So the school's come up with a creative solution -- "virtual training." Barrow said the school recently purchased a "virtual welding trainer" that allows students to learn and practice skills on a screen. "If a student takes too long on a conventional machine, they can go practice on the virtual trainer," she said. "This way the whole class isn't held up and we can also train more students."